Named after the German word for power, might, strength, ability to do and make, Machthaus , will emerge in Bayview in Fall 2015 to serve as a repeatable model for small-home city housing with goals of sustainability and minimalized operating costs. Former partners in Pragmatic Construction, one of the first green home builders in the Milwaukee area, Nikolai Usack, Stephen Servais, Common Advantage Construction, and Juli Kaufmann , Fix Development, have reunited for this project. 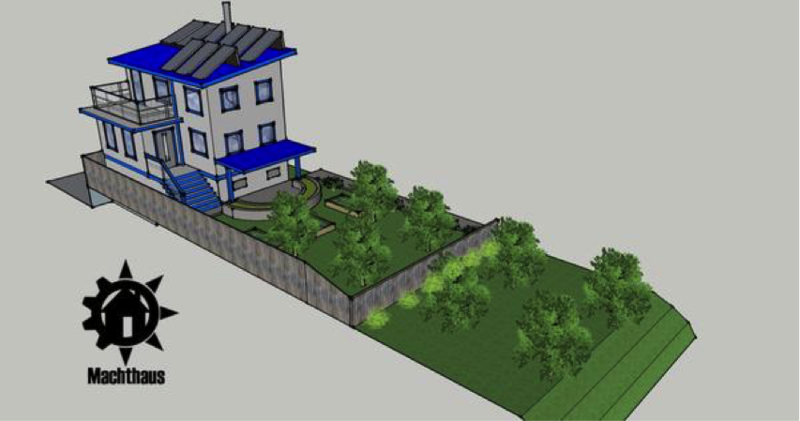 They are joined by a host of other experts in creating what they hope will be a shift in construction paradigms toward urban off-grid housing designs. Solar systems to generate power and to heat water to serve the home. However, Machthaus will connect to the city’s water and sewer systems, since installing individual water-treatment systems was not considered practical and was debatable as to whether or not it was better for the environment. The design of the building was vetted, challenged and improved and will be guided through construction by a team of local experts including Greg Thomson, AIA, University of Wisconsin-Milwaukee School of Architectural and Urban Planning, Bruce Zahn, AIA, Ken Leinbach, Urban Ecology Center, and Jamie Ferschinger, Urban Ecology Center. All designs and the entire construction process will be documented for sharing with others and the home itself will be available for tours to demonstrate building techniques and materials to other designers and builders. For more details and drawings on Machthaus, visit their website.